We noticed this little one on our bird feeder this morning. How charming! Thank you for sending us this picture of the little Owl! 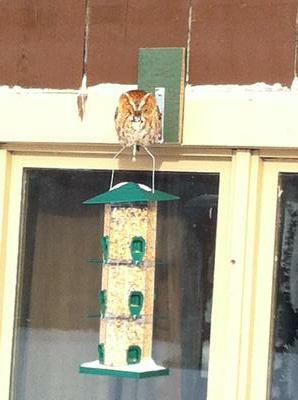 Do any of our readers know what kind of Owl this might be - if you do, please let us know! Amazing how this little Whet Owl has associated the Bird-Squirrel Feeder with a food source. He's just waiting on his next delivery order. Why go to the food, when the food will come to you? Very neat picture, although a bit hard to tell as it is far away in the picture, but I'm pretty sure it is a Whet Owl.